There are some reasons you need to convert MP3 to MP4. Your iPod may only accept MP4 format. Also, some mobile phones can only play MP4 files. However, the internet is literally flooded with dozens of MP3 to MP4 converters online and therefore choosing the right one could often be a tough task. If you are looking for the right MP3 to MP4 converter online, here are the top three based on various parameters. PS: There are some limitations as far as the file size is concerned and this is usually restricted to 100 MB. However, they do help in online conversion of small sized files for free. 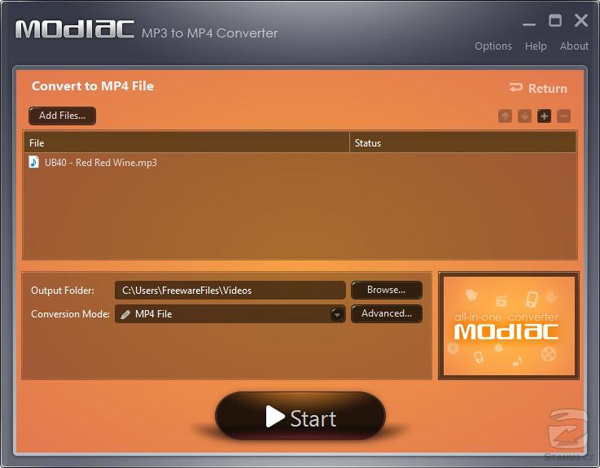 Modiac is a name that has been around for many years and over the years it has helped thousands of customers to choose the right mp3 to m4 converter online. It is easily accessible online. However, as is the case with most of the converters, the file size is limited to 100MB for free conversion. * It is a free conversion website and therefore there is no limit to the number of files that one can convert, as long as the file size limitation is adhered to. * It allows for customization of audio parameters when moving from mp3 to mp4. * Many customers have often complained about the speed of conversion and often the converted files do not get downloaded onto the download folder, though the task seemingly has been completed. * It offers the best mp3 to mp4 conversions and additionally the service provider also offers conversion into a number of other formats too. * The speed of conversion is quite good. * Allows conversion of multiple files at a time. * Though it has extraction of sound from video feature when converting it to mp4 from mp3 often it does not work well. * Speed of conversion is something that makes this converter so very popular. The file conversion is quite rapid. * It can help in multiple file conversions because of speed of conversion. * Quality of converted mp3 files is very good to say the least. * It offers a number of output formats including the much in demand mp4. * The company also offers an email support facility in case conversion is not happening properly. * The only disadvantage perhaps is the limit of file size when customers opt for free online conversion. Otherwise there is nothing much to complain for all those who are looking for a vanilla conversion. If you want to get a desktop software to convert MP3 to MP4, EaseFab Video Converter must be your best choice. If you are a Mac user, check here to get the Mac version. * Easily Convert: Convert MP3 to MP4 with three simple steps. * Convert Video Quickly: You can complete the converting process within one minute. * Optimized Presets: Convert video or audio files to various formats that compatible with different devices or players. * Extract Audio: Extract audio from video to MP3, MKV, M4V, WAV, etc.